Ugadi or the Telugu New Year is on the 8th of April and the hustle bustle in my home is quite palpable. I am so glad that little D is learning about the diverse cultures that she belongs to with her parents hailing from different parts of India. Little D gets to enjoy and celebrate so many different festivals and she is lucky that her grand~mum enriches her with all the legends behind the various celebrations and rituals. I can see that her tiny fingers still have faint traces of the colours of Holi, which she joyfully celebrated only a few days back and here she is again getting ready to revel in the festive spirit of Ugadi. This weekend she will go shopping for new dresses, ornaments and many other things with her grandparents as we all will get ready to welcome the New Year with great pomp and joy. As I busily pack for my upcoming trip, I hear mum-in-law telling her why we celebrate Ugadi, as she eats her plate of snacks, right after school. I let out a sigh of contentment, its such a huge blessing to be growing up in the envelope of grandparents love and we both are so lucky, I, to have a gem of a mum-in-law and she, to have a grand-mom who will do anything to shower little D's life with happiness, love, success and the finest things in this world. We both have learnt so many things from her and still keep learning and imbibing every single day of our life. From all the treasure trove of her heirloom recipes to the different rituals and traditions of a Telugu family, I have been taught by her. Little D's general knowledge and also her idea about all the various Indian traditional and cultural aspects is solely because of my mum-in-law. Thanks heaven for this priceless gift in our lives, Amma for me and Little D's Ammamma. She had told me as a new bride, that we celebrate Ugadi, because according to the Hindu religion, our creator Lord Brahma, started creating on this very day, "Chaitra Suddha Padhyami" which we call Ugadi day. Ugadi is a combination of the words Yuga or Era + Adi or new beginning, which therefore heralds the commencement of a new epoch. 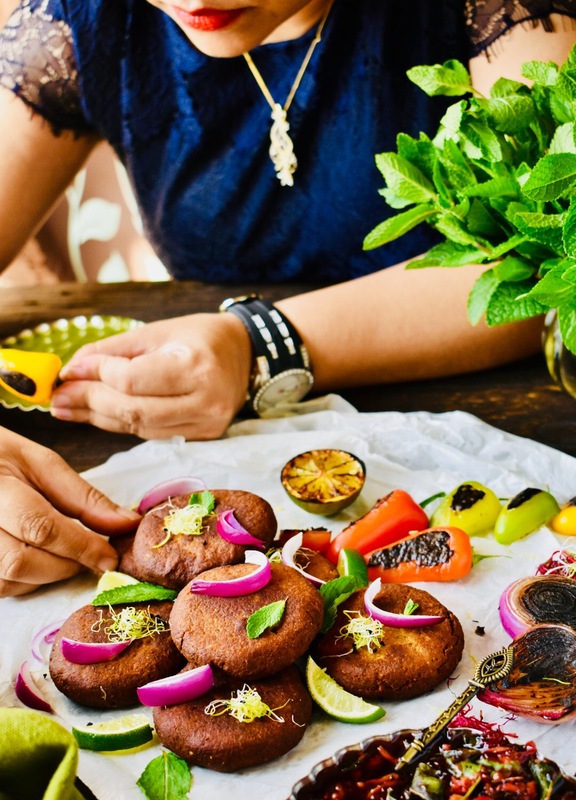 Also Ugadi is celebrated in Spring and spring itself is marked by the dawn of new life, as barren trees become resplendent with green leaves, the world is covered in colours, as happy fields flaunt their vibrant blossoms. Everywhere you look, there is joy as if after the harsh winters, the entire world is starting afresh. Wow, what a beautiful, time every year it is to start a new endeavor, whether it is in a new venture or simply new beginnings in day to day to life. I remember my first Ugadi celebrations even today. I had woken up at the crack of dawn and after the customary oil bath, had worn a new saree with its rich woven zari pallu, which had almost weighed me down with the heavily crafted silk. Amma had left on the dressing table of my room a pair of heirloom gold kangan or bangles which had been given to her by her mum-in-law and a delicately woven jasmine cluster to be pinned to my braid, which had left the entire room smelling heavenly. Bedecked in all the finery I had walked down the flight of stairs to the pooja room, the tinkling of the anklets announcing my arrival. I can never forget Amma's look as she smiled and approved of me all over again and my heart had swelled with joy and I had been swept away in a flood of happiness. A lot of dishes using raw mangoes are prepared during Ugadi and I love all of them. The unique and tongue tickling aroma of mangoes are enough to get my senses all worked up in eager anticipation of the dish to follow. The dish I am going to share with you is my Mum-in-law's Raw Mango Halwa. I was quite intrigued with this dish when I had seen her making it for the first time and I was too excited to taste it as I was wondering how a strong sour element would be incorporated into a sweet dish. But as always, Amma worked her magic and oh dear dear what I finally tasted was simply delectable and left me coming back for more and more. I have made this dish many a times, but am still unable to get to that ambrosial taste which only her Raw Mango Halwa brings with it. 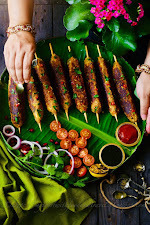 Nevertheless it has garnered a lot of content smiles every time I have cooked and served it, including Amma's, so I thought it would be a good idea to share it with you all , so that whether you are celebrating Ugadi or not, you can make this and have a bunch of happy family members and friends. The beauty of this dish is the gorgeous fragrance the raw mangoes infuses in the halwa. I associate this dish with festivities and love to make it to celebrate special occasions. So let's get started and go through the ingredients and steps that are required to make Raw Mango Halwa. Dear Friends and readers this post will also be a part of my dear friend +jayashree trao UGADI collective. 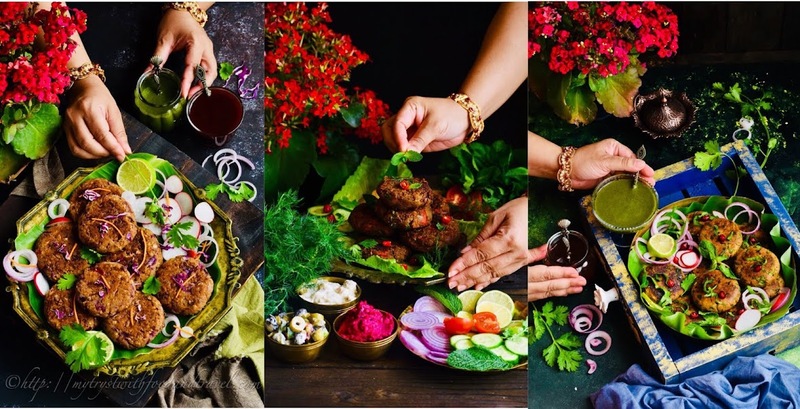 So, do check out her blog Evergreen Dishes for many more wonderful festive dishes made to celebrate Ugadi. NOTE : You might need 3 ~ 4 Tbsp more Sugar depending upon your taste. 1) Wash the mangoes thoroughly. Chop off the topmost part of the mango. Peel the skin of the mangoes with a peeler. Slice the mangoes, leaving the stone. Take the slices and grate them finely. The finer you grate them, the faster you can cook them. 2) Take a karahi or thick bottom pan and first take in the sugar. Pour in water and combine them together. Add the grated mango once the sugar syrup starts boiling. Mix well and simmer. Simmer and cook the grated mangoes. Once the mango is soft, increase the heat and let all the liquid evaporate. Once that happens, remove from the heat. 3) In a karahi or thick bottom frying pan, take clarified butter. When hot add the semolina. Fry the semolina in the clarified butter. Fry till the semolina changes colour. Now simmer the semolina and milk mixture on low flame. Cook them together till all the liquid evaporates and the semolina is cooked completely. Next add the condensed milk. Mix the condensed milk nicely with the semolina. Now add the green cardamom powder. 5) In a frying pan add 2 tsp Clarified butter and fry the cashew nuts and chironji. Fry till golden. Similarly fry the raisins till plump. Add the fried nuts and raisins to the semolina saving some for garnishing. You can add sugar now if required. Mix well and wait for the sugar to melt and incorporate with the semolina before moving on to the next step. As you mix the raw mango into the semolina you will see that the semolina takes the colour of the mango and eventually its flavour too. 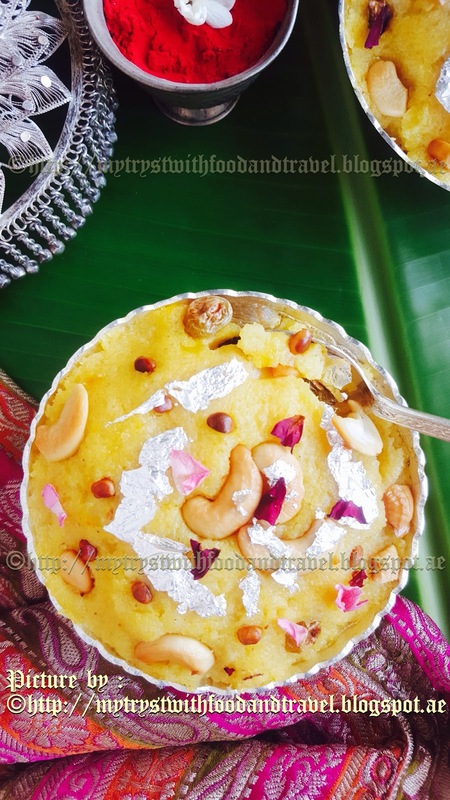 Serve hot and savour this Ugadi special sweet dish, which is indeed mouthwatering good. Add the grated mango once the sugar syrup starts boiling. If you make this dish, I truly wish that your friends and family love it as much as mine do.